Back and neck pain is terrible. 27% of adults in across the country suffer from back and neck pain. It is difficult to live with this unbearable pain. You could opt to use gravity boots, posture pumps, or an inversion chair for back pain relief at home. What is an inversion chair? An inversion seat is uniquely designed for use during inversion therapy. This fitness equipment is unlike any other in that it allows you to exercise while providing relief to back and neck pain. What makes an ideal inversion chair? How can I pick the model that meets my needs? In the guide below, we seek to answer these two commonly asked questions and more. We have done research, chose the best-rated chairs, checked what other customers had to say, and came up with the guide below. Read on and discover the best inversion chairs. This inversion equipment measures 52 X 28 X 61 inches. It can inverse up to 70 degrees. Health Mark IV18600 Pro weighs 58 pounds and can hold up to 300 lbs. The first chair on our list is the Health Mark Pro. This chair is ideal for people who suffer from constant back pain. Health Mark Pro inversion chair helps to decompress the spine thus reducing fatigue, back pain, and muscle stress. It has a simple design and can comfortably hold up to 300 lbs. Here are some of its main features:. 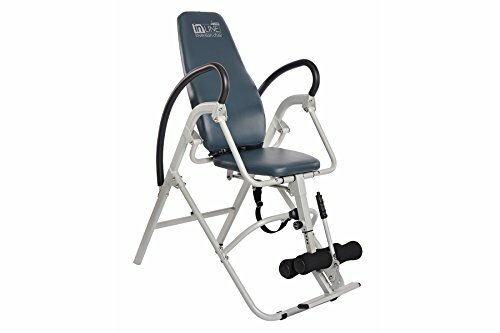 Adjustable belt: This inversion chair comes with an adjustable angle belt that not only secures you during inversion therapy but also helps you to inverse slowly up to a 70 degrees angle. Safety lap belt: This adjustable belt holds your body in place. The belt is adjustable so people of different body sizes can efficiently use the chair. Knee support: As opposed to inversion tables, this equipment has padded knee support that protects the knees from straining when you are in an upside down position. Ankle support: When your body is hanging upside down, its weight is held by the ankles. Cushioned ankle support ensures that the ankles do not get bruised or strained. Handlebar: Health Mark IV18600 Pro is fitted with a handlebar that enables you to get on and off the chair comfortably. Backrest: Ever tried to exercise on a piece of equipment that was not padded? You can attest that the exercise was difficult, awkward, and painful. This equipment’s backrest is cushioned to provide comfort. The backrest is also adjustable to accommodate users with different heights. Construction: This equipment is made of heavy gauge steel that guarantees you of long-term use. Finish: the manufacture used durable powder-coated finish to ensure its frame does not chip. √ This inversion equipment is multi-function. Apart from using this inversion chair for back pain, you can do inverted oblique crunches, inverted crunches, reverse V-ups, and reverse oblique V-ups. √ Helps relieve acute lower back pain. Did you know: Your back has more than 200 muscles? 120 of these muscles provide support for the spine. Simple exercises on an inversion chairs will help strengthen these muscles. This inversion equipment measures 50 by 27.5 by 54.5 inches. Stamina Seated chair weighs 74 pounds. Our other favorite inversion chair is the Stamina Seated inversion chair. 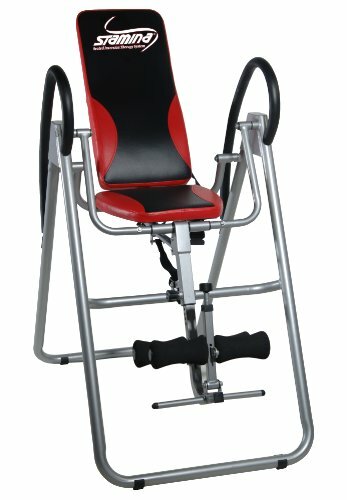 Stamina Products are the manufacturer of this inversion equipment. Stamina is an American-based company that is well known to manufacture products that are high quality and suited for different types of users. Stamina Seated inversion chair is created for stability, comfort, and security during inversion. Here are some of its main features. Leg lock system: The Stamina Seated is fitted with a ratcheting leg lock system that is designed to hold the ankles securely to support your weight. There is a push lever button that allows you to hold and release the ankles seamlessly. Floor protectors: This chair has rubber footprints that ensure your feet have a firm grip on the chair. Nylon tether strap: This strap helps you to control the inversion angle easily. Lap belt: just like the leg lock system, the lap belt is an added security feature to keep you safe when inverted. Adjustable footrest: The footrest helps you to sit in the right position when you invert and makes it simple for you to mount and dismount. Backrest: The backrest is firm and well cushioned to ensure you are comfortable and that you are seated upright even in an upside position. Slouching will only add more pain to your already hurting back. Adjustable beam: working out on a piece of equipment that makes you look like an adult riding a kid’s bike is… humiliating. The Stamina Seated has a height adjustment beam that one can adjust the seat according to their height. Padded handlebars: Stamina’s manufacturer included padded handlebars in this model. These handlebars allow you to invert and return to an upright seated position without straining your fingers and hands. √ Easy to mount and dismount. √ Stamina Seated is more affordable compared to other inversion chairs on the market. √ This chair can be used by the elderly. This chair measures 44.5 by 23 by 53 inches. It weighs 62 pounds and can hold up to 250 lbs. Termed as one of the best inversion chairs on the market, the Stamina InLine has a modern and sleek design. As with the Stamina Seated, this inversion chair is also created by a US-based company, Stamina Products. This inversion equipment is ideal for young people who suffer from back pain that is a result of vigorous sporting activity or long working hours. It is also suitable for the elderly whose back pain is as a result of slouching due to back muscle weakness. Below are some features that make the Stamina InLine tick. Foot bar: A quick-adjust foot bar is fitted so that users of different heights can use this chair comfortably. You can quickly reach the foot bar while you are seated. Ratcheting leg lock system: During inversion, your legs will support your weight. For this reason, Stamina created a robust leg lock system that can hold up to 250 lbs. it has a push button release that enables you to lock and unlock your legs. Ankle support: The ankle support on InLine inversion chair is foam padded to ensure your ankles don’t get bruised from the pressure caused by the leg lock system. Adjustable strap and belt: These two exciting features are designed to keep you secure and allow you to invert your body efficiently. Floor protectors: The rubber floor protectors are slip-resistant. This feature ensures that you do not slip when mounting or dismounting the inversion chair. Comfortable upholstery: With this chair, Stamina has done a great job. They have added foam padding to the backrest so that the user’s lumbar region will have more support. Padded handlebars: The handlebars are foam-padded, making it easier for you to push or pull yourself while seated. Just like the Stamina Seated, the InLine’s frame is made of durable steel. Did you know: Smoking is a major cause of back pain? Truth be told, it is tough to work, sleep or even dance when you are experiencing severe back pain. In the past, back pain was only associated with aging. The sciatic nerve extends from your lower back all the way to your feet. Discomfort along this nerve can result in pain. Symptoms include stiffness, numbness, weakness, and excruciating pain. Inversion helps relieve this pain by using the force of gravity to decompress the back, therefore reducing pressure on the nerve. An inversion chair also helps stretch sore or tense muscles. The average cost of back surgery in the United States is $100,000. This figure only represents money you will spend at the hospital. It does account for the money you will lose while in recovery. Health Mark Pro, Stamina In Line, or Stamina Seated are affordable, and they will help you stay fit and avoid theater. Do you remember, when you were a child, how easy it was to touch your toes? How about you try it right now. Difficult, right? Through inversion therapy, your spine will be decompressed making it easier for your back to bend. Inversion therapy is highly recommended if you spend long hours on your desk job. For a long time now, inversion tables, such as the Teeter inversion table, have dominated the inversion therapy world. The recent introduction of inversion chairs into the market has brought on the question, which one is better, an inversion chair Vs inversion table or even gravity boots. An inversion chair allows you to dictate the angles of your inversion. This keeps you in charge of the whole process. You get to adjust the intervals as your body becomes more familiar with inversion therapy. However, that’s not the case with the inversion tables. With the table, you turn completely upside down in a matter of seconds. Do you want to work out your abs during your inversion routine? Hey, it’s killing two birds with one stone. You back stretches, and you get abs. Anyway… most inversion chair models allow users to move their torso easily. This enables you to do stretches and twists. Check out the Health Mark Pro. 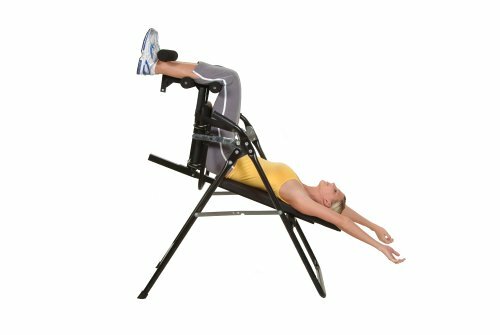 The layout of an inversion table is constricting and does not allow any movement. At the end of the day, an inversion chair is better regarding torso movement. Imagine the weight of your body being supported by your ankles only. Imagine those ankles tied to the table with thin straps. Ouch! Painful, right? Well, that’s precisely what happens when you use an inversion table. Your ankles are not meant to hold your body’s weight, but because your back is hurting and you need a great solution, then inversion therapy is the way to go. However, don’t just settle for something that might cause you pain. Inversion chairs such as Stamina In Line, Health Mark Pro, and Stamina Seated have to foam padded ankle support that keeps your ankles from straining. Get an inversion chair especially if you have mobility issues or are in your golden years. Looking for the best inversion chair? The process of searching for the right chair can be tedious. There are various models available, and you have to look at each one before making a decision. We comprehend the importance of doing due diligence before committing hundreds of dollars on a product. For this reason, we are going to list some of the essential features you should be on the lookout for before making a purchase. Comfort: check whether a chair is foam-padded on the handlebars, backrest, and ankle support. Foam-padded inversion chairs protect your body, especially the ankles, from the hurt caused by friction. Because of the comfort from foam padding, you can inverse for longer. Security: it is paramount to get inversion equipment that keeps you secure. During inversion, you do not control your body balance. If you fall, it could be catastrophic. Make sure your chair has an adjustable lap belt, rubber floor protectors, and a strap. These features ensure your security. “How tall am I? How much do I weigh?” these are factors you should put into consideration when making a purchase. Some inversion chairs can hold up to 350 pounds but would be entirely useless to you if it can only accommodate users up to 5’8 and you are a 6’2. Pick a chair that can hold your weight and accommodate your height. Also, ensure that you have enough storage space. Most inversion chair models do not fold up. Inversion chairs are not costly, but they aren’t cheap either. Pick a chair whose frame is made of steel. Remember as you are growing older, back and neck pain will occur more frequently. So, invest in a chair that will last longer and one that you can easily mount and dismount as you are aging. When search for an inversion chair, pick on that has a simple design. The chair should be simple and effective; simple for you to get on and off. Acquiring a chair with an intricate design will only add more pain to your back. Don’t add insult to injury. What is your budget? Every wise woman or man works with a budget. Before making a purchase, consider your budgetary allocation. This will help you to choose a model that has the feature you want, and that does not leave your wallet bleeding. Did you know: inversion chairs are a great alternative to ? When getting a chair, don’t just get one based on reviews on random sites. We recommend that you check reviews from other users. From this, you get to understand what other users like about a specific inversion chair, what exercises they found to be most effective, and what they don’t want about their inversion chair. 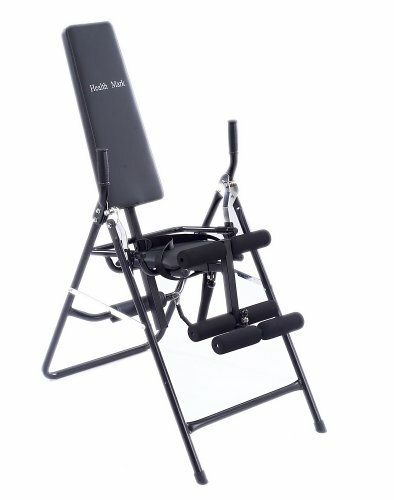 How often should I use an inversion chair? This question is quite common, especially from people who are new to inversion therapy. The answer is simple. When you are starting out, your body is not used to hanging upside down. So, it is best to start with a slight angle, say 30 degrees for two minutes. Then as you progress, add the angle of inversion and the amount of time spent on the chair. Remember, do not overdo the exercise. You don’t want to hurt your back any further. Fact, every person on the face of the earth will suffer from back pain at some point in their life. It may be as a result of work or aging. Fact, back surgery costs thousands of dollars and don’t even mention the recovery time.